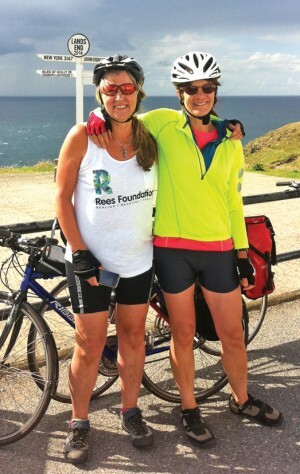 Hannah Genders shares the story of her charity cycle ride from Land’s End to John O’Groats. I’m writing this travelling back from our big End-to-End cycle ride – that’s Land’s End on the south-west tip of Cornwall to John O’Groats on the north-east tip of Scotland. The way we cycled it, mainly on little roads and cycle paths, added up to a distance of one thousand and fifty seven miles, and what a fantastic adventure it has been. I rode the trip with my good friend Gabrielle, who has never done any long-distance cycling before, so it was a major achievement for her too. The first thing that really struck me was how beautiful our little island is, and how each county is so different. We started with the sharp valleys of Cornwall, its steep banks of wildflowers and little coves. This is one of the main reasons for cycling the end-to-end this way round – the hardest days are at the start, because in Cornwall and Devon you are constantly crossing little river valleys, which means the roads are very up and down and don’t retain any height, forcing you to cycle slowly, walk on the sharp ascents and enjoy the flowers. The other reason for cycling from south-west to north is that the prevailing wind is predominantly south westerly, which we found very much to our advantage on this trip. We reduced the cycle miles to around 60 per day for these harder days at the start. The first week of the ride saw us staying with friends and family, including a couple who live in an eco-house in Trevone, where I had done the garden six years ago. It was lovely to see them and to see the garden looking so good now that it has matured – the plants were all chosen to survive in this very exposed site with salty winds. Pressing on through Devon, the hills remain sharp and the landscape doesn’t change dramatically until you reach Somerset. This is the area I grew up in and so I became very nostalgic cycling across the Somerset levels towards the Mendip hills. This is the county that had seen so many problems last winter with all the flooding. I can remember many more dairy farms when I was young; now cheap imports of milk have put most of them out of business. The Mendips were easily navigated along the ‘Strawberry Line’ cycle way, a disused railway that once took taken the strawberry crop from Cheddar to Bristol and London. Taking the Severn Bridge towards Monmouth, the scenery changes again as rolling hills and river valleys turn into the Wye Valley and the lovely county of Shropshire. This area produced some of the best cycling on the whole trip; gentle hills and farms dotted through the landscape, with plenty of excellent tea shops. Just beyond the county of Shropshire we had our one day of urban riding as we negotiated Liverpool, cutting out as many of the major roads as possible by going on to the Wirral and taking the ferry across the Mersey. Just as we were beginning to get into a rhythm of cycling, the mountains loomed, with the Lake District on the left and the Yorkshire Dales on the right – stunningly beautiful scenery although it involved tough climbs. Thankfully, we had met up and stayed with my brother Andy who cycled with us the next day, guided us through the best route and carried our bags for a day, which was bliss. Before you know it, at the end of the first week and 500 miles of cycling you have reached the Scottish border – but this is still only half the distance and there’s the whole of Scotland to get through before the finish! To avoid a second day of urban riding (through Glasgow) I had planned a route further west, taking us over the Isle of Aran, involving two ferries to get us on the island in the middle and off at the top end. This was a wet ride as it rained the whole time we were on Aran, but then cleared again and were back to the lovely, sunny weather. Our maps were now on a different scale as we navigated our way through to the Scottish highlands and had one of the best days riding up Loch Linnhe and overlooking Ben Nevis. We saw two ospreys on this part of the ride; it was stunning. The route then travels up the Great Glen to Inverness; this was the furthest north I had been on previous trips to Scotland and I was keen to see landscapes up there. The Black Isle, which sits just above Inverness, is mainly arable farms with some beef cattle, but it then changes to large areas of marshland with mountains in the distance and very small hamlets of houses. The A-roads become like our minor roads with very little traffic and passing places for vehicles. Heaven for the cyclist. The top coastline on the north-east tip of Scotland is very like Cornwall where we started, with rugged coves and sandy beaches but with very few people around. John O’Groats is like Land’s End, rather commercialised but a decent enough place to get a cup of tea in celebration – we are English after all! – and then head home. The second thing that struck me on this trip is how freeing it is to travel light, with only enough clothes for two days (washed out and hung on the back of the bike to dry as we travelled). It makes me want to get home and de-clutter my life! A massive thank you to all the people who supported us with food, company, bike maintenance, donations and encouraging texts.